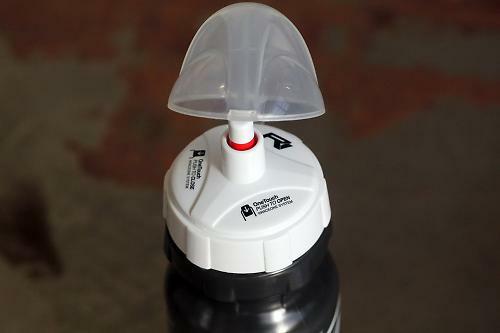 The Race One One Touch bottle is essentially the classic cycling bottle but with a specialist valve cap, which theoretically takes the struggle from mid-ride slurping. However, despite decent quality materials and thoughtful details there's room for improvement. Available in standard 750ml or compact 600ml versions, it's made from medical grade low density polyethylene (LDPE). This a long standing favourite not known to taint ones choice tipple, or leach potentially nasty chemical stuff inside our bodies. The shape and semi matt texture mean excellent compatibility with standard cages, jersey and rack bag pockets. Even some notoriously springy titanium cages haven't caused mortar-esque mischief across poorly surfaced roads or bridle path. Gunslinger quick draws are matched by secure grip in all conditions and glove types. Talking of which, the protective cover prevents that stomach churning mix of bovine dung, spent diesel and wet gritty stuff contaminating the spout. Unfortunately, the lip proved a little tricky to operate in gloved hand, especially mid ride. So what's special about this cap then? Well it's a simple screw top design made from polyamide with a clever sprung-spout and deep indentations for improved purchase. Press once to pop open; again to close. It's a very light action, which took a few rides' practice before becoming truly instinctive. Getting a controllable flow requires depressing said valve halfway with your tongue, just like using a hydration pack valve. This encourages more frequent sipping and remains consistent. There's no need to squeeze frantically as it empties, although the bottle's malleable enough and will fire a stream of fluid if required. Prod shut when you're finished and we're talking drum tight; no leaks even when held upside down and shaken vigorously. That means there's no danger of sticky energy drinks pooling in pockets or residual spatter along the down-tube. Beverages of all types taste refreshingly authentic too, although lightly carbonated varieties caused unwelcome air lock, cured by unscrewing the cap slightly, releasing pressure and snugging tight again. Talking of strip downs, it disassembles for meticulous cleaning. Race One recommend water as hot as 40 degrees, although marinating in Milton was my preferred post ride option. Ultimately, I'm fairly impressed but disappointed at the lack of spares. Losing that little spring means buying a new bottle. Eight quid isn't outlandish but the ability to purchase a replacement top would make it a lot more appealing. "Drinking today was never been so easy. You open the top bottom with one hand: one click to open, one click to close. Thanks to the RACEONE patented system for the water releasing. The design was studied to optimize the grip. Available for 600 ml and for 750 ml capacity. RACEONE, innovative Italian company, proposes a new bottle with a drinking system including a patented opening and closure system called 'ONE TOUCH', made in Italy. This patented system allows you to drink by using only one hand, only the click of one finger, even in the worst conditions. When the button is in the position 'closed' the system guarantees at 100% any water loss". Broadly agree, although the protective cover was fiddly to release in gloved hand. 'Open/Closed' opening system. Quick, easy, safe and can be completely disassembled. You can open and close the cap with a simple click! Raceone® with ONETOUCH, revolutionizes the bottle standard! Now the opening is simple and facilitated. Made of PP Random, against mud and dirt, suitable for use in extreme conditions, keeping the drinking area clean. Bottle made from LDPE and available in 600 or 750ml capacity. High quality materials and generally clever design. Lack of spares backup is slightly disappointing but with basic care, there's no reason it shouldn't last a good while. Materials and texture ensure precision fit and excellent grip in all weathers. Eight pounds certainly isn't outlandish and on par with some premium brands. However, its still twice that of two bog standard 750ml trade types. 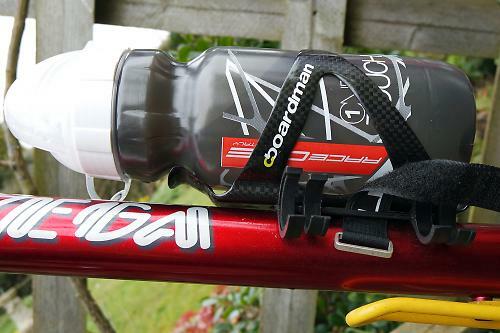 Overall, it has met the design brief extremely well and a genuine improvement over standard bottles. However, it does take a few practice runs before becoming totally intuitive and a more pronounced lip would make opening the protective cover in full-finger gloves much easier. 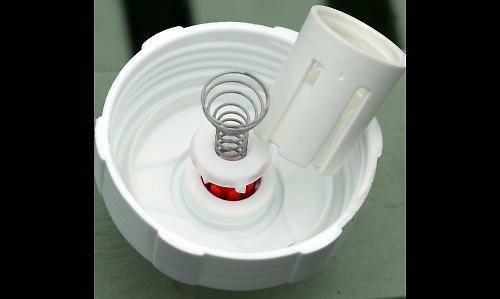 Good quality materials ensure beverages taste authentic and spout system is really convenient. Minor irritations rather than dislike but the ability to buy replacement parts in the event of loss/damage is a missed opportunity. Would you recommend the product to a friend? Yes, with those minor reservations.